What to wear to a funeral. We usually plan what to wear on almost every occasion but some occasions are not the kind of an event on which we want to look like a fashionista. So proper colours to wear to a funeral? What is the dress code? let’s check them out. The funeral is one of those sober occasions when we just want to condole the grieved person. At that moment, a gentleman’s purpose when attending a funeral is to pay his respects to the deceased and comfort the others around him. Not to look amazing and grab attention. So when attending a funeral, you must keep some key facts in mind as per your physical appearance is concerned. Always keep in mind that attending a funeral in anything too flashy or “fashion forward” is the height of bad taste. And It depicts you are not able to choose the right thing for the right occasion. Dressing appropriately shows support and puts the focus on the funeral. It is generally understood throughout the Western world, and in Christian funerals, that acceptable dress in a funeral is a dark suit, a muted tie and polished shoes. You do not need something Extra Ordinary while attending a funeral. The typical attire for a funeral is the ‘traditional western attire’. Other than a black suit and white shirt, you could even consider a three-piece notch lapel suit in a conservative pinstripe with either a tie or even a bow tie, perhaps. If not a black or navy blue suit, then colours are usually kept to a conservative palette, colours from maroon and darker shades of brown are often alternatives. Avoid bright colours and bold fashion statements for any type of traditional ceremony. It’s a safe bet to ask the family if they have any dress codes they’d like; in remembrance of the person who’s passed. If you do not have a suit, or not able to wear a suit at that moment, then some modest conventional dress code could also save you but keep in mind, tone down the colors. This is one of the most appropriate and considerate dress code while attending a funeral. You can choose his traditional black dress with black tie, and do not worry what age you are. This is the perfect decision. As is it mentioned, that White dress shirt is not a compulsion. 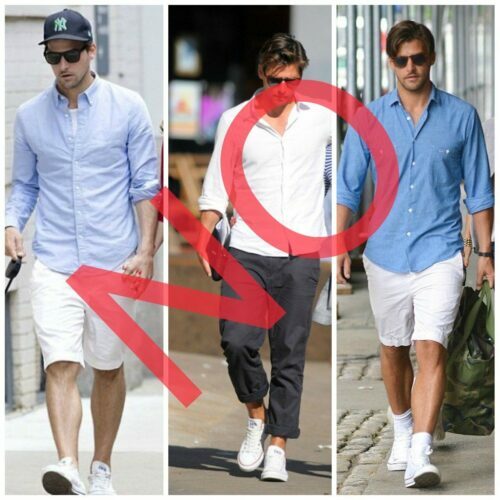 One can go for the light color shirt but keeping the color palette at low. A dark navy blue suit is also a good choice if you do not wish to wear a black suit. Even a darker shade of charcoal grey is not bad. The Summer funeral may be a bit hard to attend and keeping the weather in mind; you can just wear a dress shirt with a dress pant. The tie is not compulsory, but you may choose it if you want. Consider a dark solid colour plain tie. This one is also a perfect dress if you do not want to get too formal with the dress. A simple button-down shirt, with a charcoal grey jacket and dark colour pant, is a good choice for young boys or even mature men. Keep the look neat and tidy, and shoes must be formal. It is not always necessary to wear a suit. You can wear a sweater or cardigan with a dress shirt, or the one with long sleeves and a collar. Keep the color combination dark or if possible, then go for black. Black jeans or cotton pant can also work with this attire. 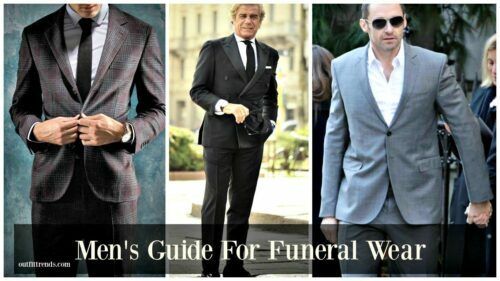 For fall funerals, you can wear a sweater with a dress pant and dress shirt, and as it is mentioned earlier, keep the colors light and try to avoid prints which are very flashy or catchy. In modern times, black suits are no longer mandatory in funerals. If only a navy pinstripe suit is available, it is acceptable. With suit as for the dress shirt, white is the most formal color, but other toned-down shades are good alternatives as well. This one quite a modern attire for men to attend a funeral but not a bad choice at all. If you have to attend the funeral in between you office hours and does want to give the feel whole day that you have attended a funeral, then this brown shade suit can also be a good option. Until unless your dress is not very funky, then a patterned suit with darker shades can also work. Many young men do not want to go home again and change the dress, then a decent gentlemen’s dress can work for both work and funeral. Every gentleman should own a classic black suit. The benefit of a black suit versus a tuxedo is that it can be worn not only to black tie weddings and cocktail parties but to sober gatherings, too. At a funeral, go with a white shirt and black tie. Save colours, patterns, and flashy accessories for a more appropriate occasions.